ULTRA South Africa, Africa’s largest electronic music festival, announced to great excitement a few weeks ago that they are bringing, for the first time ever to SA, THE CHAINSMOKERS LIVE. 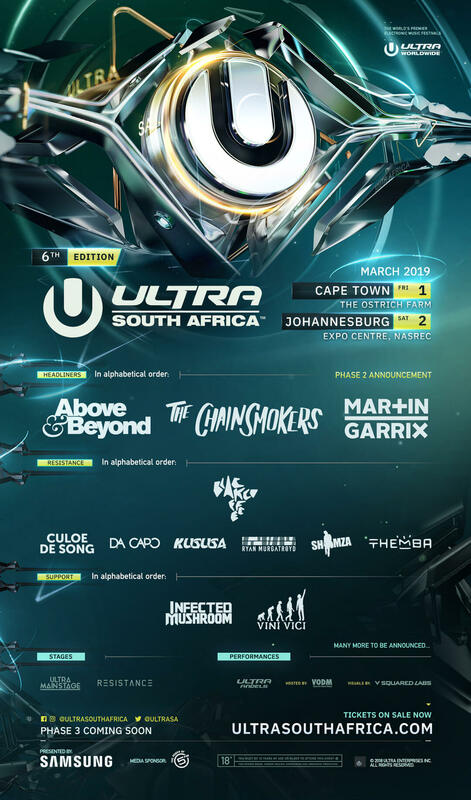 Now, they’ve just dropped their full Phase 2 lineup which includes some eagerly awaited returning heroes of the ULTRA SA stage, plus some new names to get you excited. Phase 2 starts with – the prodigal son of Ultra SA – MARTIN GARRIX! The WORLD’S NUMBER 1 DJ FOR THE 3RD YEAR RUNNING, and for good reason, Martin will return to ULTRA to remind everyone of his insane energy and impeccable performance. The next headlining act to be announced is ABOVE & BEYOND. One of the world’s leading trance groups, and one that SA fans have been begging for, this English trio is guaranteed to bring huge excitement to festival revelers. International support acts have also been revealed and include the hi energy duo, VINI VICI, performing at ULTRA SA for the first time. Next up are the legends of psy-trance, INFECTED MUSHROOM. They have a huge fanbase in SA already, but this will be their ULTRA debut and will be welcomed in style. The 2019 RESISTANCE stage lineup is next, and features world-renowned DJ and South African legend, BLACK COFFEE, who will be headlining again, and this time he’s bringing some good friends along for the ride. These DJs will provide a lineup of the best acts that have supported him throughout his incredible 2018 year, and includes CULOE DE SONG, DA CAPO, KUSUSA, RYAN MURGATROYD, SHIMZA and THEMBA with more to be announced. Brought to you by Samsung.